The collection focuses on showing the fast take-over of the calculator market by electronic companies leading to a shutdown of several factories and putting a lot of highly qualified mechanical engineers out of their jobs. Many families must have been affected by this rather sudden and dramatic change in job perspectives. It wasn’t just the calculator market being disturbed by the upcoming electronic industry. Shortly afterwards also the typewriter market was hit by this development. 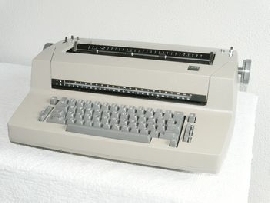 For that reason also two typewriters are mentioned here; a late mechanical one (IBM Selectric and a Brother Daisy Wheel type printer with a small display and some primitive edition options.